Many of us teach children who have been through things we as adults could never fathom having the strength to go through. I have taught children who do not have running water or electricity. I have taught children who the only meals they eat are the ones they eat at school. I have taught a child who was homeless and a child who was so malnourished she did not learn to sit up until she was 4 years old. I teach children who touch my heart and change my life. God is using me in the lives of these children and He uses them to teach me patience, unconditional love, forgiveness, grace and humility. I am blessed in so many ways by the children I teach. I want to create a room they love coming to and being a part of. This is not something you go to the teacher store and buy. And when you take down all of those decorations this is what matters.....teaching from the heart. 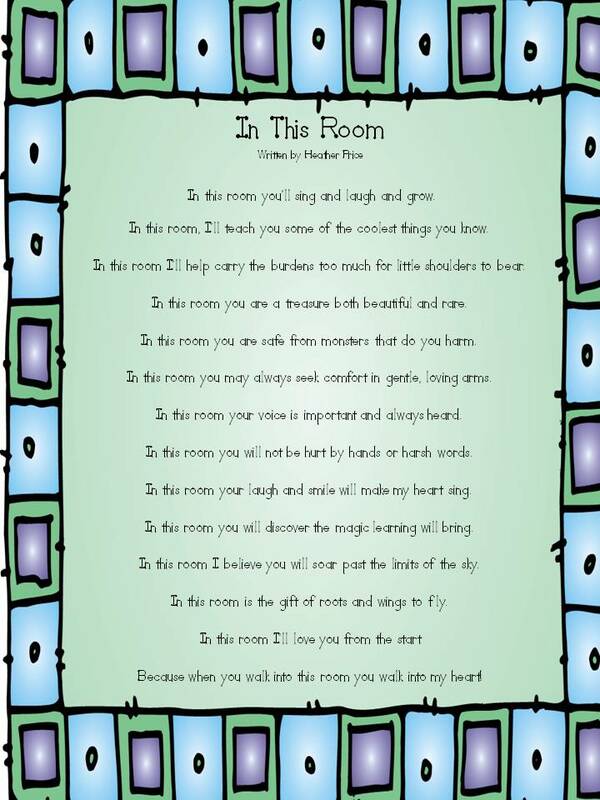 I hope this poem helps you think of what you want your classroom to look like through the eyes of a child's heart. May God bless your school year and each of the little ones He has blessed you with! I too have taught such children...broke my heart! Thank you for such a sweet poem! How wonderful! Thank you for sharing this. My students are like this too, and I'm honored to be able to teach them. The new year starts tomorrow and this is the perfect poem to read before I go off to sleep. Thanks so much. 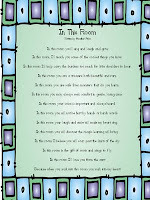 Thank you for sharing "In This Room". I have the very same children in my class every year. Children living in orphanages, in homeless shelters, children wearing the same clothes every single day, kids who only eat at school. It is heartbreaking. But I like to think we do make a difference in their lives. I would love for anyone to share this poem. It is with each one of us that it needs to start with reaching our children and touching their hearts. I do ask that if you share that you please include my name and the link to my blog. Thank you to each one of you who understand what a special job we have as teachers, especially to our needy children. I am blessed to be their teacher. Wow, I love this! Thank you so much for sharing it! I am loving all of your ideas - I am your newest follower! Okay after the tears! I love this poem. I too teach in a school where many of the student don't know when their next meal will be. Many days we have students waiting for someone just anyone to come pick them up and take them home. I have taught at this school for 15 years and just love to see the kids that always return and have made it. We see those that get off the path also and it brings hope that they still feel safe enough to stop by and say hi. THANK YOU for what you do. You have changed hearts and opened minds. What a beautiful poem... I am so glad I found this today. I got a new student today and found out she was sexually abused by her father starting at the age of 4. I just couldn't image.... my heart broke/breaks for her. God led me here to your blog tonight just for this. Thank you Heather! Thank you for the inspirational poem. I will hang it in my room. Like you, I believe children need more love in their life. I am so glad to have found "you" today. I needed this reminder today. What a sweet poem Heather! We are so blessed to have you as a TBA author! My entire classroom is in need of hearing this every day. I teach inner city ELL students who have seen horrific things, endured terrible things before they came to this country. They live in poverty here but it's better than where they came from......Hard to imagine.........This poem is beautiful! Thanks! Heather, thank you for linking to this...I just "pinned" it! Hi! I just discovered your blog and I love it! You are an inspirational teacher! I really love all of your fun ideas and freebies you share! I just got my teaching license, so am looking for my first teaching position and really am getting a lot of ideas from your blog, hopefully I end up in a younger grade so I can put all of your creative ideas to use! I love your saying you must touch their heart first! Thanks for inspiring me! Teaching With Haley O'Connor – A lifelong journey in education.